Pack a down blanket for travel in just carry-on! Best soap dish for travel – a soap bag! Will your Amazon purchase be what you expect – or counterfeit? Today we moved again. Again I expected to sail on to the next island but again we just motored a short way. 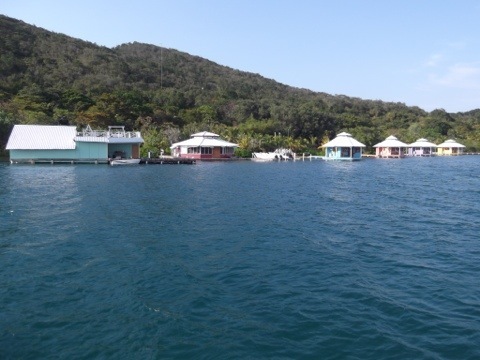 We are in Port Royal, anchored out at a buoy kindly put out by the owners of Mango Creek Lodge here in Port Royal. It is their beautiful, colorful over-the-water cabanas we face. I knew about Mango Creek Lodge from Lori, who told me and said it is a nice courtesy to go on land as soon as we get there and say hello to the owners. I told this to the family as we pulled in and tired up to the buoy. And they did go in. While I was cleaning up below, they quietly dropped the dingy and headed ashore. I came up and looked at them, hands up to ask “what…” No reply. how long would they be ashore? Why wasn’t I allowed to come? Where we’re they going? Would they be shopping, because I’d like to buy food. I knew nothing. But now this was two times I was left stranded and I was not comfortable. Anyway, this was my view of Mango Creek Lodge. It looked warm and inviting. Wondering about me? I invite you to visit my regular website. Just for kicks…here’s the Adobe GoLive 5 Bible book’s companion site I created back when I wrote non-techie tech books. Everything on this site is real. I don’t fake or filter photos. I don’t pretend I’ve been someplace or have used a product. I may accept products to try, but no one can buy my endorsement. ©2011-2019 Deborah Shadovitz. Words, images, and other content may not be used without prior express written permission from me. This site is hosted at Pixelgate Networks, an excellent small shop where they care. I’ve built my site on WordPress using Press Customizr Pro and have added a lot of my own custom styling. I use StatCounter to know basics of visits but don’t collect info about you.